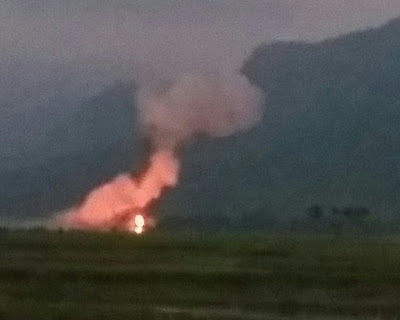 Maungdaw, Arakan – Although the situation in Maungdaw has calmed down there was an arson attack in Wabaik hamlet in Kyi Gan Pyin village tract. Today, October 16th, 2016 at 6:25pm the military reportedly torched a Rohingya house in Wabaik hamlet in Kyi Gan Pyin and some huts nearby Wabaik hamlet. 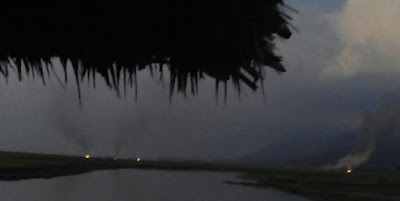 “The situation in Maungdaw has calmed down, but suddenly at 6:25 in the evening the military torched a house in Wabaik and 5 huts by the prawn lakes which are located about a mile away from Wabaik,” a Rohingya man told RB News over the phone while stating he is watching the fire of both house and huts. “I can see it all now,” he added. Since last night, October 15th, 2016 at 7 pm to today, October 16th, 2016 morning 1 am, the military raided all the houses in Nwa Yone Taw hamlet in Yay Myat Taung village tract. While checking the houses the military looted gold and jewelries worn by the Rohingya women and they abused the Rohingya men, according to the villagers.